Attendees enjoy a variety of training implementation techniques. These may include balloon art, yoga, song writing, or the occasional dance move. Experiential sessions provide unique, hands-on, tactile learning environments. 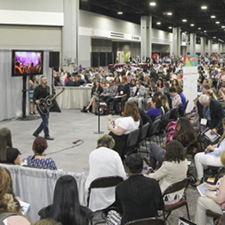 20’x 30’ carpeted space on the EXPO Floor, perimeter seating (approximately 20 seats), one skirted head table, one flip chart, one wireless handheld microphone, an internet connection, and plasmas to show your presentation. (If you require any other equipment, please contact the appropriate vendor as listed in the Exhibitor Service Manual and make the necessary arrangements).